I've expounded on locked questions before and mentioned that these often age poorly. If something is to be locked, especially today, it should have some amount of moderation and curation done. These are things that we should be putting in museums as questions that can produce good quality and we should aspire to ("see, look, we can have good material on very soft questions if people act to moderate and keep the quality up") rather than things we want to lock away and forget. To this, I really have to ask about why Why should developers have private offices? was locked. Poor quality and negatively scored posts should be deleted. Too chatty / not constructive comments should be deleted. What really gets me here is that this question really is just a poll with one answer that is reasonable (but doesn't answer the poll question) and 23 answers that are "I've got an office" or "I have an open plan." I feel that this type of question - old polls - really doesn't age well and isn't indicative of what good quality on the site should be. It is exactly the watercooler conversation type thing and getting to know you that the six subjective guidelines were put in place to prevent. That it hasn't been seen much and there are no in bound links from other questions on Programmers.SE suggests that it really isn't that valuable of a post. This type of question is the type of thing that a Slashdot poll (for example do you need to wear headphones while working) does better than a Q&A format site. Delete all poor quality material (I believe this would be 'all posts other than the accepted answer' - or first and third if you stretch it a bit), remove the burnination tags (jobs and job-title are both in the current round), and rework the body of the question so that it isn't a poll and is answered exactly by the accepted answer. I was the one who historical locked it responding to a flag requesting the same. It has at least one good attempt to answer either a question with a number of problems as perceived by the current scope and rules of the site. Another note, a steaming pile of crap answers constitute history to me. History may be entertaining, we may admire it, it may have some unfortunate stains that some would rather forget. An historian looks for the truth, no matter how painful. We learn from the mistakes of our past, so I feel to clean it up then lock it is basically being a revisionist. I am not for revising history, whether it be content locked into the history archive, hell I don't even like revising history in my Git repositories. I felt it met all of that. My criteria might not be exactly what other moderators have, but again, you guys elected me to take some discretion from time to time otherwise Atwood would write a script to replace me. If you feel that I was wrong in my decision then downvote this answer please. If I get 5 downvotes from the community (not a net score of -5 but 5 individual downvotes then I will accept it should have been deleted. A moderator may also reverse my decision if they feel necessary. 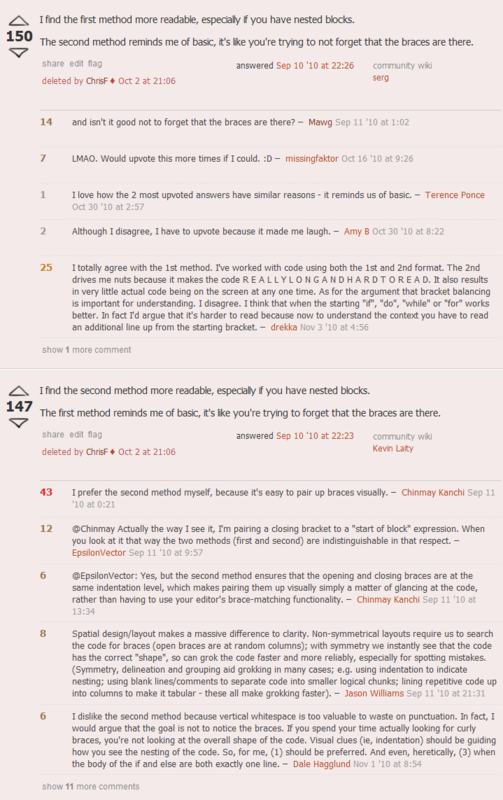 TL;DR Suggest to undelete the question since it was edited to a better shape and made match the top answer. After that, remove "poll item" answers invalidated by the question edit and reopen. I think that in its current shape the question staying visible is not okay, even as historically locked. Low quality "historical context" seems to totally obscure worthy content in there. As of now, it looks like a blatant poll, followed by multiple useless poll item "answers" (including even a different question posted as an answer) so that most readers could only wonder what was the reason to keep it at all. Worth noting that it looks like an exceptional case for question to be so much overwhelmed with bad content. All other historical questions I recall do have bad stuff (otherwise there'd be no lock), but good parts in these are prominent enough and readers don't have to guess why these were decided to keep. 1. Delete. Easy way out, the one I wanted before I stumbled over this meta question, but now, upon closer studying of the top answer I am not quite comfortable about it anymore. 2.1. Add a moderator comment referring to this meta discussion, so that readers interested in historical context could discover it without having to stare at all 20+ low quality answers over there. After that, remove all answers except the top one, then lock it back. So I know everyone here is all about private offices, how many developers actually have them. I am sort of half skeptical. I can believe that lead developers have them, but that's normally just one person in your average office. That makes me wonder, how many developers have private offices. Which leads to the actual question: why should they have them? Question edit summary would better refer this meta discussion to help readers of edit history find out what led to the radical change. After the edit, remove all answers that fail to match the revised question (as far as I can tell, these would be all except for the top answer), then reopen. Side note an edit drafted above would also "trigger" removal of the opening sentence from the top answer ("I think the question should be...") but that's rather minor. Advantage of #2.1 is that it guarantees that worthy content is preserved. In comparison, 2.2 carries a (rather minor) risk that edited question will be eventually closed again and deleted. As for #1 (delete), it looks really inferior in comparison. It only doesn't deviate from our locking practices, but so does #2.2, which additionally offers a solid chance of preserving worthy content. Assuming that risk involved in #2.2 is minor, it looks like most appealing option. Can we please cleanup this popular question?